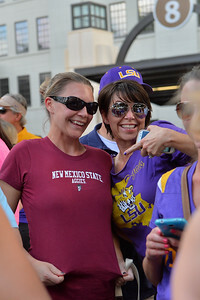 September 27, 2014: An New Mexico State Aggies fan and an LSU Tigers fan pose for a photo before a game between New Mexico State and No. 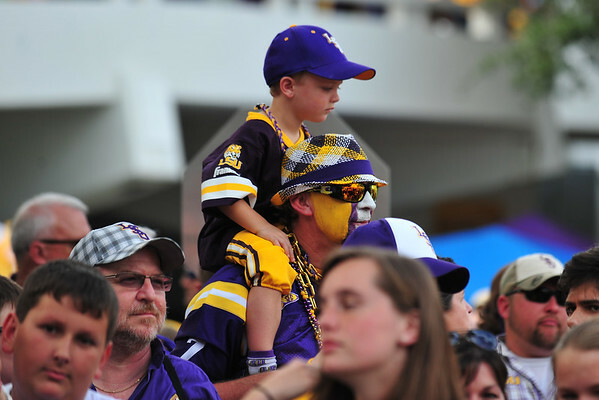 17/18 LSU at Tiger Stadium in Baton Rouge, LA. 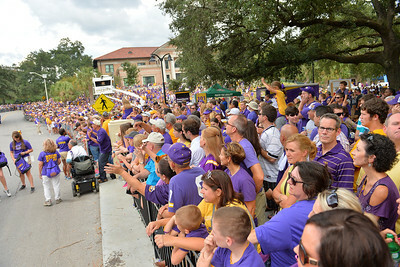 September 27, 2014: LSU Tigers fans participate in the Tiger Walk before a game between New Mexico State and No. 17/18 LSU at Tiger Stadium in Baton Rouge, LA. 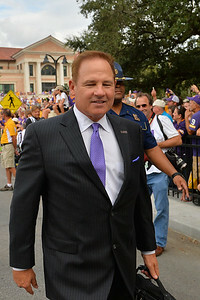 September 27, 2014: LSU Tigers head coach Les Miles participates in the Tiger Walk before a game between New Mexico State and No. 17/18 LSU at Tiger Stadium in Baton Rouge, LA. 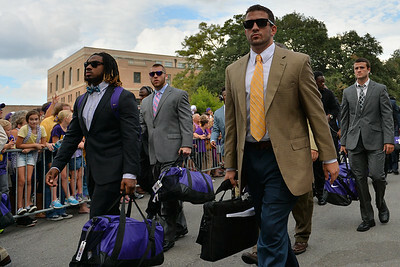 September 27, 2014: LSU Tigers players take the Tiger Walk before a game between New Mexico State and No. 17/18 LSU at Tiger Stadium in Baton Rouge, LA. 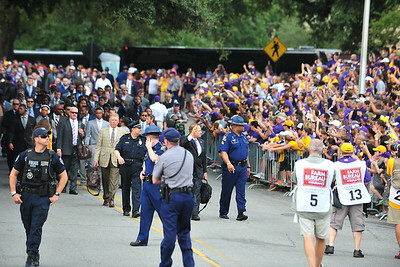 September 27, 2014: LSU Tigers head coach Les Miles greets the fans during the Tiger Walk before a game between New Mexico State and No. 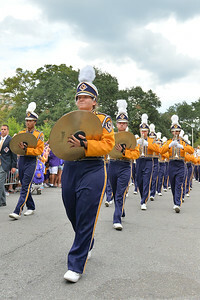 17/18 LSU at Tiger Stadium in Baton Rouge, LA. 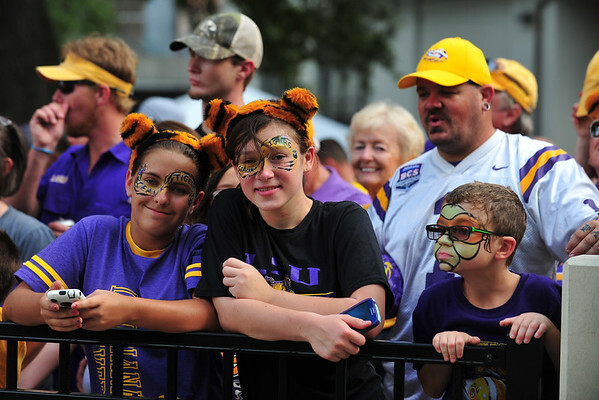 September 27, 2014: LSU Tigers fans line up for the Tiger Walk before a game between New Mexico State and No. 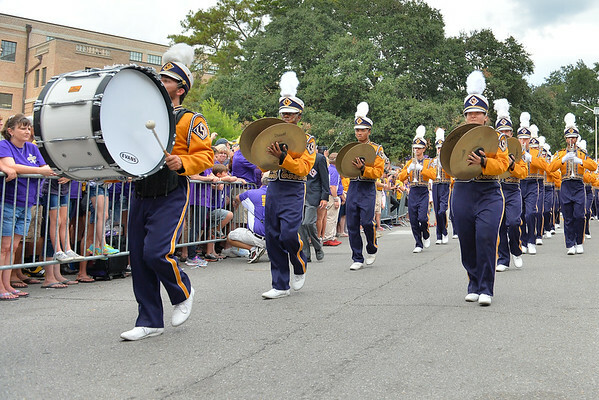 17/18 LSU at Tiger Stadium in Baton Rouge, LA. 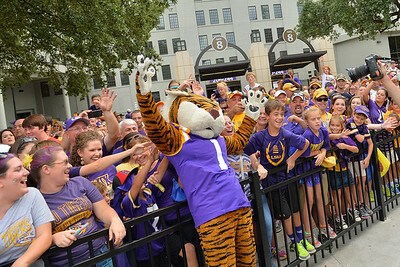 September 27, 2014: The LSU Tigers mascot Mike the tiger poses with fans before a game between New Mexico State and No. 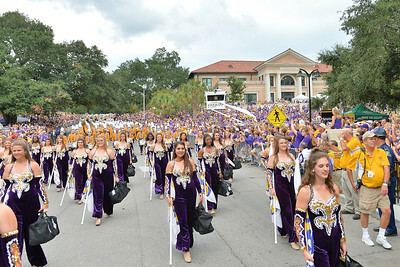 17/18 LSU at Tiger Stadium in Baton Rouge, LA. 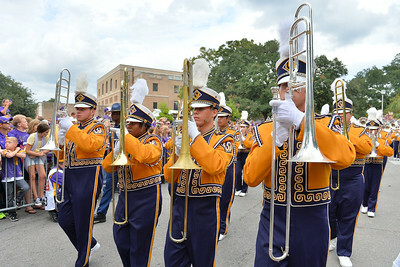 September 27, 2014: The LSU Tigers marching band and Golden Girls take the Tiger Walk before a game between New Mexico State and No. 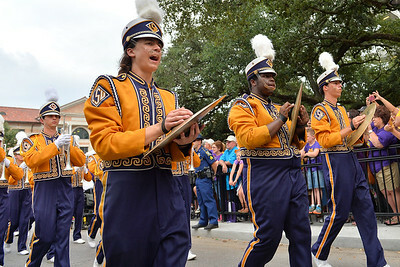 17/18 LSU at Tiger Stadium in Baton Rouge, LA. 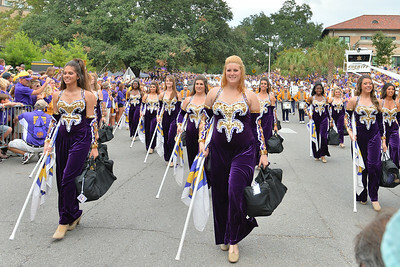 September 27, 2014: The LSU Tigers Golden Girls take the Tiger Walk before a game between New Mexico State and No. 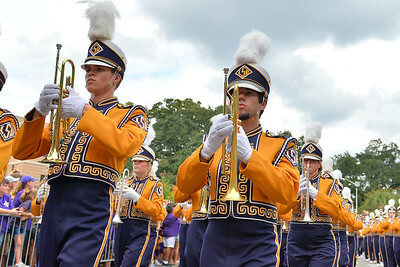 17/18 LSU at Tiger Stadium in Baton Rouge, LA. 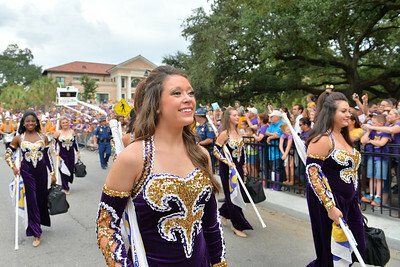 September 27, 2014: The LSU Tigers Colorguard takes the Tiger Walk before a game between New Mexico State and No. 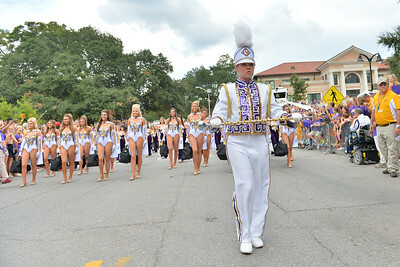 17/18 LSU at Tiger Stadium in Baton Rouge, LA. 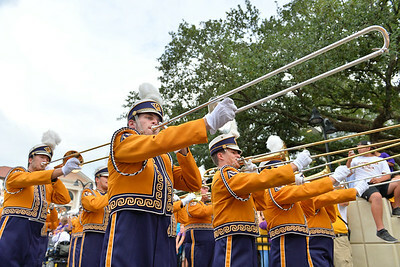 September 27, 2014: The LSU Tigers marching band performs during the Tiger Walk before a game between New Mexico State and No. 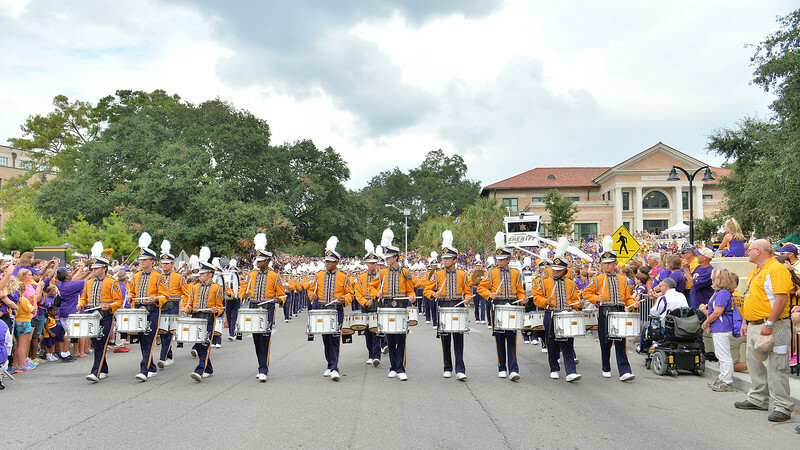 17/18 LSU at Tiger Stadium in Baton Rouge, LA. 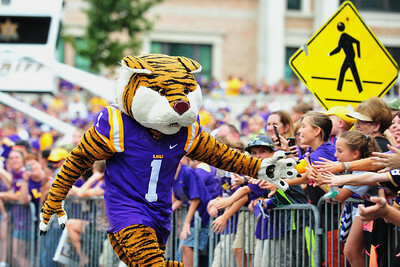 September 27, 2014: The LSU Tigers mascot Mike the Tiger greets fans before a game between New Mexico State and No. 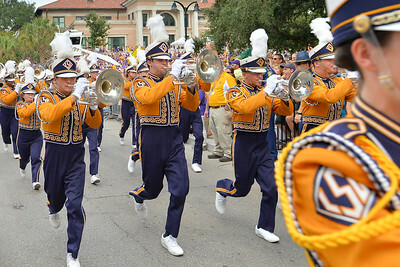 17/18 LSU at Tiger Stadium in Baton Rouge, LA.